Our family Christmas Eve dinner is usually my Mom's famous lasagna. This year we did something a little different. Chicken Legs made his favorite meal for everyone - grilled skirt steak. Since Chicken Legs was grilling, I helped out with the sides. I made our favorite potato casserole and these wonderful sautéed mushrooms. They only take a few minutes to prep, and they smelled amazing while they cooked. We used a mixture of white button mushrooms, baby bella mushrooms and shiitake mushrooms. 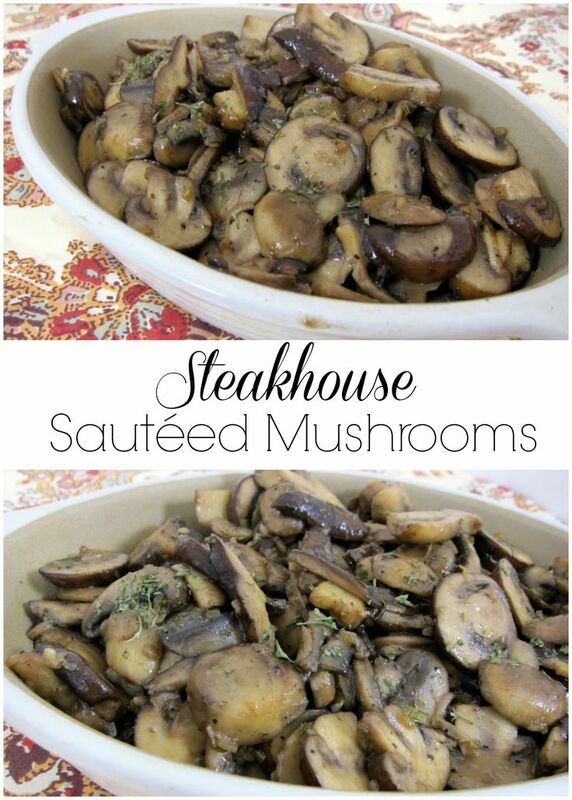 They tasted as good, if not better, than any sautéed mushrooms we've had at a fancy steakhouse. Melt butter in large skillet. Add mushrooms and sauté for a few minutes, until mushrooms start to soften. Stir in remaining ingredients and cook uncovered over low heat for 30 minutes or until mushrooms are tender. yum!! these sound delicious, what a wonderful dinner! I wish I were a mushrrom fan or else I'd cook these in a heartbeat! My Dad would love this recipe ! Thanks for sharing ! These sound much better than the butter only ones I made - I'll save this for next time. Happy New Year, Steph! To you & Chicken legs & all the animals. Mushrooms look GREAT! Definitely going to fix them the next time we grill ribeyes. I have a question (off the subject)..I'm interested in trying out one of the Disney cookbooks. Which one would you recommend I get first? Sounds simple and delicious. Will be trying this soon. Happy New Year Stephanie. Sabrina - I would suggest "Chef Mickey Treasures from the Vault and Delicious New Favorites". It has a really nice variety of recipes. Happy New Year Lea Ann! Those do look scrumptious, Steph. Mushrooms and steak, a match made in heaven.